Nurse preceptors have the power and opportunity to inspire nurses to achieve greatness. 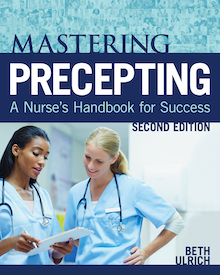 Effective precepting programs depend on two critical groups: nurses who organize and manage the programs and nurses who support, teach, and coach. Author, Beth Ulrich provides the knowledge, tools, skills, and wisdom both groups need for success.